EGS provides technology-driven parking guidance and space administration products that share straightforward parking spot availability data, designed for driver and management convenience. A real-time inventory of parking spaces not only saves time for those entering a parking facility, but also directs the flow of parkers, preventing congestion and allowing for a significant reduction in vehicle emissions by eliminating the “cruising effect” of searching for a place to park. 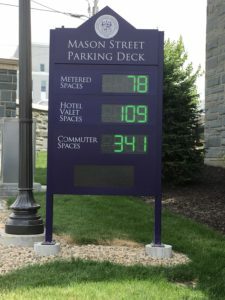 Constantly updated counts at key decision making points—on-street, at garage entrances, and on each parking level—make for a smoother parking experience. Parking Guidance System technology works in real time with ultrasonic sensors, induction loops and barrier contacts, physical inventories, and integration with existing parking management systems. Our team is well-trained in Intelligent Transportation Systems (ITS) and is ready to answer any questions that you might have in regard to your parking guidance or access system. At EGS, we understand that enhancing the motorist’s experience is a benefit to that extends to your business. When we are your partner installing or servicing parking guidance systems, this enables you to be the reliable partner of every driver coming to your facility. These relationships are what we are all about.